If the server where you are planning to install GroupWise Mobile Server has a Web server running on it, you must stop it before installing GroupWise Mobile Server. Download the GroupWise Mobile Server compressed executable file (gms204.exe) from the Novell download Web site to a temporary directory on your Windows server. Click Next. The contents of the installation package extract and the Welcome dialog box appears. Click Next to display the License Agreement dialog box. 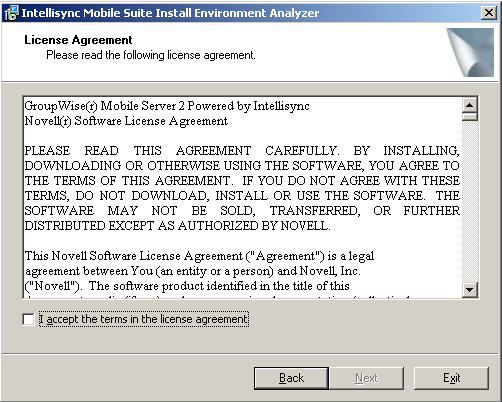 Read the Novell GroupWise Mobile Server License Agreement, accept the License Agreement, then click Next. 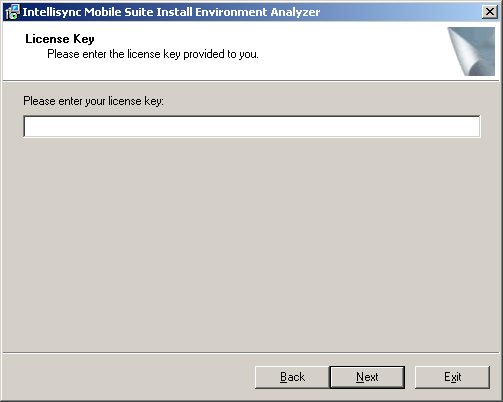 Specify the license key for your software, then click Next. Follow the prompts, referring to the Intellisync Mobile Suite Installation Guide as needed, until you reach the Mail Server page. 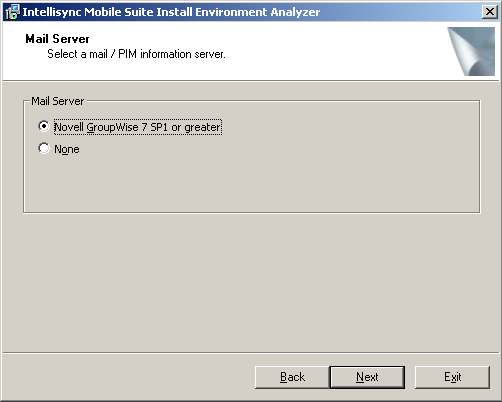 Select Novell GroupWise 7 SP1 or greater, then click Next. Specify the SOAP port for the POA. The default port is 7191. Select Use SSL if the POA is configured to require a secure SSL connection with GroupWise Mobile Server, as described in Section 2.2, Enabling POAs for SOAP. Specify a GroupWise username and password to test the connection between GroupWise Mobile Server and the POA, as described in Section 2.3, Selecting a Test User and POA. Select the method that you want mobile devices to use when authenticating to the POA for the post office where the mobile device user’s mailbox is located. 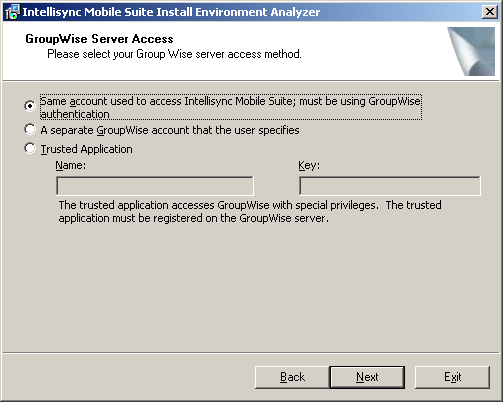 Same Account Used to Access Intellisync Mobile Suite: Select this option if you want GroupWise Mobile Server to use the same usernames that users are already using in GroupWise. This is the recommended option. Separate GroupWise Account: This option provides an additional layer of security by having your mobile device provide a generic password to GroupWise Mobile Server. GroupWise Mobile Server then prompts you for your GroupWise password each time synchronization is required. The Trusted Application option provides this additional layer of security much more conveniently. Therefore, the Separate GroupWise Account option is not recommended. 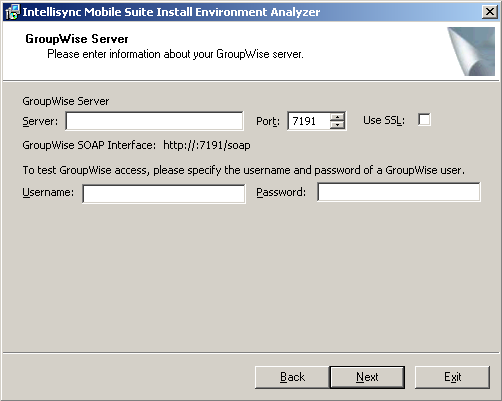 Trusted Application: To review the benefits of setting up GroupWise Mobile Server as a GroupWise trusted application, see Trusted Applications in System in the GroupWise 7 Administration Guide. For instructions specific to setting up GroupWise Mobile Server as a trusted application, see Section 4.7.1, Creating a Trusted Application on Windows. If you want to use this access method, you must select one of the other two access methods for your initial installation, start GroupWise Mobile Server, set up GroupWise Mobile Server as a trusted application, then repeat the installation to select this option and specify the trusted application key. 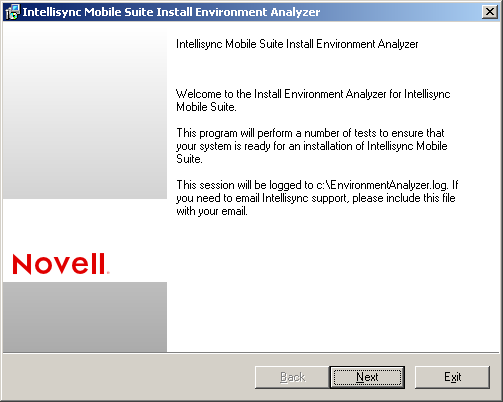 Click Next, then continue following the prompts, referring to the Intellisync Mobile Suite Installation Guide as needed, until you complete the GroupWise Mobile Server installation.